I had the most wondrous thing happen last night. In the middle of the night I woke up and opened my eyes to the most intense and blinding light that I've ever seen - it was coming from a corner of our room where we have a sliding glass door and at first I thought it was coming in through the curtain from outside. The light was only there for a few seconds and as I focused in on it, I saw the outline of a man who was wearing a white robe. He was standing at the foot of our bed, was at the corner of my side of the bed and had a medium size build (was maybe close to my height at 5' 6"-ish). I wanted him to talk to me, but he didn't say anything. I was confused with the significance of what I thought I was looking at while I was in the moment and after I blinked, the light was gone. The room was dim again and the measly light that was coming in through the curtains was nothing like the intense, blinding light I saw before I blinked. I KNOW that a presence was with me. I don't know if it was really Jesus or if it was an angel. I don't know why he was there, if there was any more significance than just us being together? I've never experienced anything like this before. I've heard of God speaking directly to people and I've read instances of blinding light similar to what I saw last night, but I have to admit, I'd always questioned whether those people were delusional or if they'd maybe just been dreaming. I was not dreaming. I was wide awake and I don't think I'm delusional. After it was over, I asked God if there was something he wanted to tell me, a purpose he had for me, or in general, what it was that I was supposed to take away from that experience. I didn't hear any booming words coming from above and he didn't send any quiet thoughts through my mind. I don't know what his message was supposed to be for me for me last night. I do have a stronger faith this morning and without a sliver of doubt, I know there is more than this life. I feel renewed to live the life that He has designed for me and I will keep praying that I figure out what my true purpose is so that I can live a life pleasing to Him!! It's been a while since I've had something move me to tears. This video succeeded in doing just that.... I am so inspired by these little people and their ability to overcome obstacles, persevere through challenges and ultimately live to their greatest potential! As I watched the video above, I was really struck with my thought process and how different it is from when we only had one child - a typical child who just grew and developed as he was supposed to. Before Luke, I probably wouldn't have thought much about the advanced gross motor skills shown by the kids in this video. Individuals with Down syndrome generally have low muscle tone and may lack some of the coordination that comes with advanced gross motor skills and activities like roller skating, cheerleading and waterskiing might seem out of reach. I am so inspired by these kids and can only hope that through lots of physical therapy and some God-given natural abilities, Luke will have the opportunity to enjoy similar experiences throughout his life! Ruby's Rainbow is a non-profit organization dedicated to the higher educational needs of adults with Down syndrome. We grant scholarships to adults rockin' that extra chromosome for post secondary education, vocational or enrichment classes. Our hope is to raise the expectations of the individuals and show the world just how cool and capable they are! We spent this evening at a co-worker's home in Rittman where we had the pleasure of enjoying the parade that kicks off the Rittman Sleepwalker Festival. Charlene's home is at the beginning of the parade route and even though we didn't allow him to run into the street to retrieve it, Matthew still came home with about 3/4 of a gallon size Ziplock bag full of candy! The parade was wonderful and lasted close to 40 minutes - similar to the parades I recall from my own youth, when the floats seemed to creep by and the parade candy was plentiful, different from most of the parades we witness today that rarely last more than ten minutes and you're lucky if you catch one or two pieces of candy! Aside from the parade, Charlene really made the evening special by providing pizza and drinks for her guests (not only did we have pizza for dnner, but she also sent some home with us for lunch tomorrow). She was an excellent hostess and we had more fun tonight than we've had in a while! I took a little video when we got home of Matthew thanking Charlene for having us over! In the past, we've always cut Matthew's corn off the cob, but tonight he finally seemed interested in eating it the old fashioned, true American summertime way - off the cob! And he loved it! 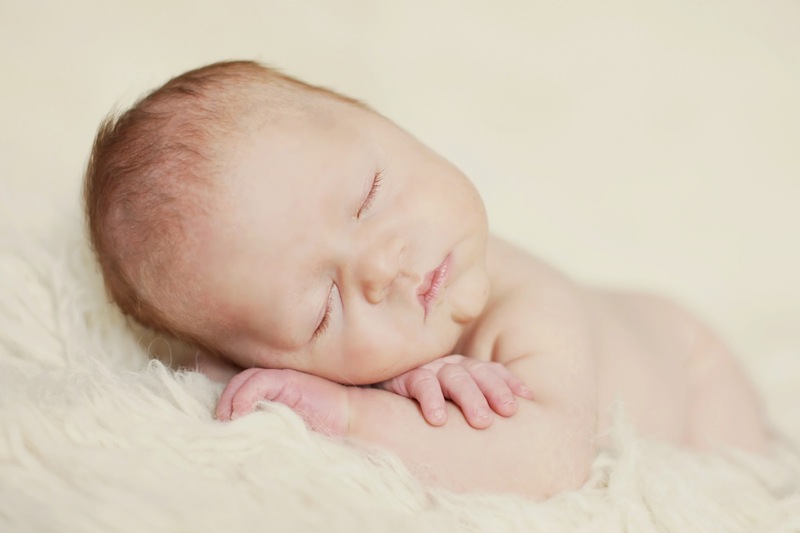 What will my newborn with Down Syndrome look like? One of these babies has Down syndrome. Can you guess which one it is? I think I read the list at least a hundred times. I'm way more than a little embarrassed to admit that on occasion I even wondered if he'd look like an alien... whatever that looks like.... I scoured the internet for photos but never felt satisfied that I had the right image of who he'd be. My doctor attempted to convince me that he'd look like our family, like our other son, but in the end I just wasn't sure and decided it was probably best to just pray about it. I reminded myself to trust in God and the plan he had for me and my family and by His grace, I was rewarded with a beautiful baby boy... to my surprise... one who looks like my family and in some ways, even like his brother Matthew. When I look at the photos above, I now see the two boys who own my heart... but in case you were wondering... it's the boy in the second photo that has Down syndrome... isn't he beautiful? Aren't they both beautiful? Is building a man really as easy as building a bear? Recently, a Facebook friend posted a comment about how she wished you could build a man like you can "Build a Bear" - you know, the boutique bear making workshop? Another friend responded with a comment that basically said something along the lines of "it is possible to build a man.... it's through being a good parent". That response was really grounding for me and because it's so easy to get caught up in all the baby-hype we have going on at our house right now with two under two that sometimes I think it can be easy to forget the end game. I'm not naive enough to think we are doing everything right, but I hope we're at least on the right track. Parents out there... what advice do you have for us new families when it comes to "Building a Good Man"? We've been busy with life over the last few weeks, so today I'm committing to updating the blog and backdating the articles so they fit in on an accurate timeline of how they happened in our life. I'm starting with one of the highlights of our summer... Luke's baptism! We were so thrilled to have Luke blessed by our Pastor with the holy water of the baptismal font! Tomorrow morning Luke will be baptized into the kingdom of our heavenly father and we will promise to raise him in accordance with the word of God. In preparation, this afternoon I dressed him in Matthew's old baptism suit to make sure the fit was right... while he was dressed up, I decided it was worth taking a few photos so we can look back on this spiritual milestone for our family. 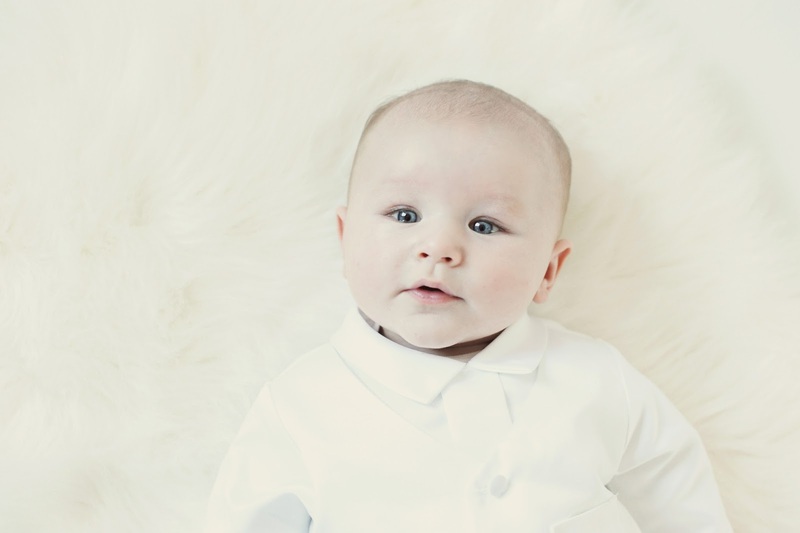 For fun, here is Matthew in the same outfit when he was 4 months old courtesy of Courtney Broome Photography! This morning I re-calibrated the settings on my camera (last used to capture fireworks on the 4th of July) and spent a few minutes with Matthew and Luke taking in some shots of our bare skinned babies! Baby skin is so wonderfully soft, I hope I will always remember what it's like to hold such silky skin! On another note.. I cannot believe Matthew was so smiley for the camera this morning... he was up last night at 12:05, 12:35 and again at 12:55. Eventually I pulled him from his crib, grabbed a blanket and moved to the recliner, which is where he and I slept until 6:30 when he woke up begging to read a book. Additionally, I know that Luke was also awake during the middle of the night because I distinctly remember hearing him cry and then kinda sorta remember seeing the light come on in the kitchen as Dustin worked to prepare him a bottle. It's a good thing we are a good team, while our kids generally sleep pretty good throughout the night, raising essentially two babies can be brutal sometimes! Luke has pretty much earned the title, "Master of Tummy Time"! Besides, that "oh so adorable" smile, isn't his little wisp of hair on the left so sweet? For the last year, I've been finding myself repeating "this is the best stage so far" and somehow it manages to just keep getting better. I love being a mom! I read the obituary below last night and afterwards I couldn’t sleep… I mean I actually did fall asleep after going to bed, but was awoke with thoughts of both Christy and my son Luke at 2 AM and stayed awake until my alarm went off at 5:15 when it was time to get ready for work. My thoughts were complex (as you’d expect if they were enough to keep you up in the middle of the night) and the themes centered around the wonderful impact Ms. Koolen had on the world around her… it was obvious based upon the wonderful words chosen by her loved ones. I was also struck by the story about Christy in the Special Olympics… the visual created in my mind while reading those few sentences was nothing less than a moment of magic and I can only hope to someday make such a wonderful gesture of teamwork and support for others. Just amazing. And then my thoughts traveled to Luke. What will his future bring? What treasures does he hold in his heart that will someday be released for the betterment of our world? What does this mean for Matthew? What will he learn from his brother? How will they work together? Will he have the same kind of love for his brother that Christy’s siblings had for her? I have so much anticipation for our future. And then, when I still couldn’t sleep… I prayed. I prayed for Christy Koolen’s family, those she’s touched and is leaving behind and then I talked to God about Christy and shared how I hoped such a special person was playing a wonderful role in heaven and also that she had a beautiful reunion with her mother, no doubt a strong and loving woman who rebuked the system and an American culture who didn’t do a good job of supporting individuals with special needs back in the 50’s – what a wonderful mother she must have been! And then I prayed for my family… for Matthew and Luke and me and Dustin. I prayed to God that he would forgive our sins, our faults and that he’d continue to open our hearts to the future he has in store for us. I prayed that our family will find a way to make the most of our lives and that we will support, love and uphold one another until our days here are over and we are reunited in heaven. And then my mind reeled some more and finally I was up with a cup of coffee in hand, ready to start the day. I know I will continue to reflect on the full and fulfilling life of Christy Koolen and am grateful to her family for lifting her up in a way that shared such inspiration for me and highlighted the wonderful potential in store for baby Luke! Besides the fact that I’m a bit sleep deprived, I feel so blessed today! Christy Koolen was born to Martin and Althea Koolen in Lincoln, Neb., on Nov. 20, 1952. She was born with Down Syndrome and despite the doctor's harsh advice that she be placed in an "institution" she was welcomed into the family home by her loving parents and doting siblings Marty Jr, Kent, and Gretchen. She spent the next 60+ years being a constant source of joy and fulfillment to all who knew her and therefore loved her until she left this life with her usual quiet grace and dignity on July 5, 2013. In 1959, Christy moved with her family to Billings, where she attended special education classes at Children's village (a program started by parents of Down Syndrome children) and then at Garfield School until she was 20 years old. She then attended the Sheltered Workshop (later COR Enterprises) for the rest of her life, where she achieved many commendations for perfect attendance while helping with projects stuffing envelopes, shredding paper, and other activities. She liked her teachers and friends at COR, especially her lifelong "boyfriend" Kenny Murphy, with whom she enjoyed having lunch together every day. In their younger years, Christy and Kenny enjoyed getting together to play records and to go bowling with their peers every Saturday morning at Center Lanes. When asked how she did at bowling, she always said she "got 4 strikes" because maybe that had happened once. Christy loved to dance and never missed going to dances sponsored by the Yellowstone Association for Retarded Children (YARC). She and her mother were members of First Presbyterian Church, where they had many friends. Christy loved to listen to her many record albums and she loved to watch her favorite programs on TV. Somehow she knew what programs were on every channel even if she didn't watch them. She loved her black cocker spaniel "Patsy" and she never went anywhere without her Slinky in hand. Christy accompanied her mom and dad nearly everywhere for most of their lives, and after her father Marty died in 1977, Christy and her mother Althea remained inseparable, living in the family home until Althea was diagnosed with Alzheimer's in 1996 and St John's Lutheran Home welcomed both Althea and Christy to continue living together at St John's. After Althea died in 2002, Christy was able to continue living at St John's, where she was "adopted" by the loving and caring staff (and the residents) as their own little sister. The nurses and residents loved hearing Christy giggle, loved making her laugh, loved to hear the beautiful music coming from her record player, and loved to dance with her in her room. When Christy herself recently fell victim to rapidly progressing Alzheimer's, she was lucky to be in the best possible place for the finest care from those who loved her. Christy was preceded in death by her parents, Marty and Althea. She is survived by her brothers Marty Jr. (Jacquie) of Fremont, Neb., and Kent (Susan Nybo) of Billings; her sister Gretchen Wagner of Red Lodge; her nieces Heidi Wagner of Billings and Kim Salacinski of Denver, Colo.; and her nephews Jason Wagner of Billings, Jeff Koolen of Lincoln, Neb., and Marty IV ("Dutch") and Mike Koolen of Minneapolis, Minn. She is also survived by her extended family of "sisters" who cared for her at St John's, and will be missed by all who knew and loved her. She NEVER complained, even to the last, and was thankful for everything. She was a gift to us all, a blessing in our lives. She was that rare soul of gentle purity, devoid of anger, pride, jealousy, selfishness, or any of the emotions that demean the rest of us. She was pure innocence and joy, kindness and respect, happiness and compassion, humor and good-natured mischief, and wit that would surprise and delight us. She simply brought out the best in all who had the privilege to know her. As an example of her selflessness, when she was a young girl she entered a race at the Special Olympics and was actually winning the race when she stopped short of the finish line to turn around and happily applaud her fellow racers, cheering them as they crossed the finish line - ahead of her. Cremation has taken place. A memorial service in Christy's honor will be held at the Kathy Lillis Chapel on the campus of St John's at 1:30 p.m. on Tuesday, July 9. The family extends its heartfelt gratitude to the angels at St John's Lutheran Ministries for all the loving care and compassion they provided to our little sister all these years. In lieu of flowers, the family suggests donations to St John's, COR, YARC, or the charity of your choice. So it's been happening for a while now, but I've only recently captured it on film! Yesterday morning I was able to get Luke rolling over on camera! He doesn't actually roll until it gets closer towards the end so you may consider fast forwarding! For fun... here is a video of Matthew learning to play his new harmonica! I love when he tries to make the sounds of the harmonica with is voice instead of blowing air to make the music! Kids are so funny! PS - Please ignore the half shabby-chic painted buffet in the background! It's been a project we've had in the works for nearly two months now... hopefully someday soon we'll get it finished!! I took a half day off work this afternoon to capitalize on the abundance of ripe red raspberries following all this rain we've been getting. I have some work to do this afternoon since I plan to make the rounds on our backroads scouting for the typical advertising of our local Amish that typically consists of a standard end-of-the-driveway sign that's either been handwritten or sometimes stenciled and painted. My goal is to make enough for our family and also the family of a cousin who is coming home today from the hospital with her third baby. I already have half pint jelly jars, Pectin, sugar and a few recipes, so the berries should be sufficient in completing what we need to get started. I spent some time earlier this week reading up on the basics for canning county fair worthy jams and thought I'd share for others who also enjoy preserving - Judging Criteria for Canning. Color-characteristic of fruit, clearness-jellies, translucent. Container-glass, practical, clean sealed lids no paraffin seals, neatly labeled, specific size. I have been having so much fun getting to know my camera over the last few months! I took these photos tonight during the Wooster fireworks and I can't wait to find another photography class to take so I can learn more new tricks... I really feel like I've improved since the basics class that I attended back in April and while I know I have a long way to go, I'm gaining confidence along the way and am really enjoying building some new skills! Prior to the fireworks starting, I googled some basic settings for capturing fireworks and then spent some time with my manual before it got dark. There were some trees blocking my shots (mental note to find a better location next time) and the rain sprinkled some, but otherwise it was pretty fun and I'm learning how cool it can be to experiment with various settings! Happy 4th of July!